I know what you're thinking. Why would I put tofu in chili? 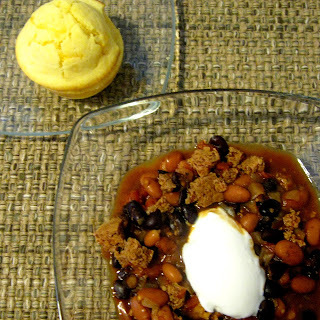 Just make vegetarian chili with beans. I could, you could, it would be delicious too! But the tofu adds something to the chili. But, this chili is the best the next day. Don't get me wrong, it's really good (to everyone who tried it at least) the day it's made. But the next day? The tofu sort of becomes part of the chili and it's not as prominent. I did do something different though. I froze the tofu first to get a different texture. Freezing the tofu before you use it allows you to "crumble" it after you thaw it. I personally forgot to take it out of the freezer so I ended up microwaving it to thaw it enough so I could cut it into tiny cubes (but don't tell anyone). It will be easier if you remember to thaw it, maybe take it out of the freezer the day before and throw it in the refrigerator. It changes the texture of the tofu. Instead of a creamy and slightly gelatinous texture (if you will) it has almost air bubbles in it and when you crumble it then it becomes slightly more "meaty", dare I say it. But that's what I mean when I say the second day it all blends together and is so good I ate two small containers. My husband was lucky he took some for lunch that day or he may not have gotten any more. If you're not feeling the tofu then of course you could just add mushrooms or "meat" crumbles or more beans. Whatever makes you happy, you're the one who will be eating it. This? This makes me happy although I would also be just as satisfied with the alternatives, I'm sure. I made some basic cornbread muffins with some cheddar baked in to serve with the chili. 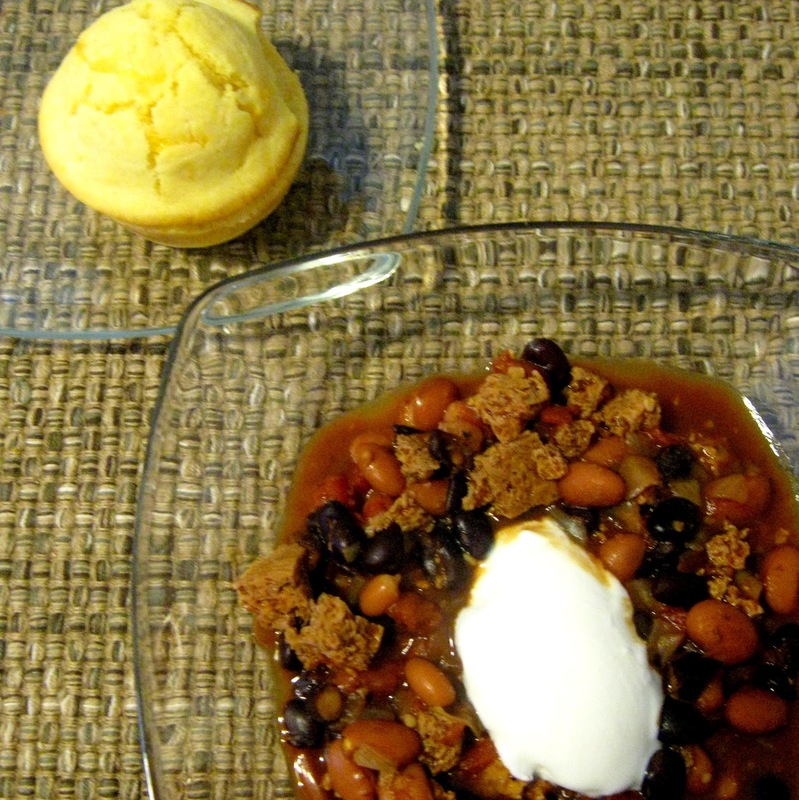 I love cornbread with my chili. Yum! I also forgot to add cilantro the top of the sour cream. You should though, if you like cilantro. It's usually pretty busy around here during dinnertime though so I tend to forget things sometimes. I hope you like this as much as we did! 1. In a large pot over medium-high heat cook tofu and ¾ teaspoon of the cumin for about 3 minutes. Add the soy sauce, stir, then cook for 1 minute. Remove the tofu from the pan and set aside. 2. Add the canola oil to the same pan, then add the remaining ¾ teaspoon cumin and onion. Saute the onions for 4 minutes or until softened slightly. Add the tofu back to the pan with the tomato paste, chili powder, cayenne, black pepper, salt, and garlic. Stir the mixture, then add water, the beans, and the tomatoes. Bring the mixture to a boil then cover, and reduce heat to medium-low. Simmer for 30 minutes, then stir in the vinegar. 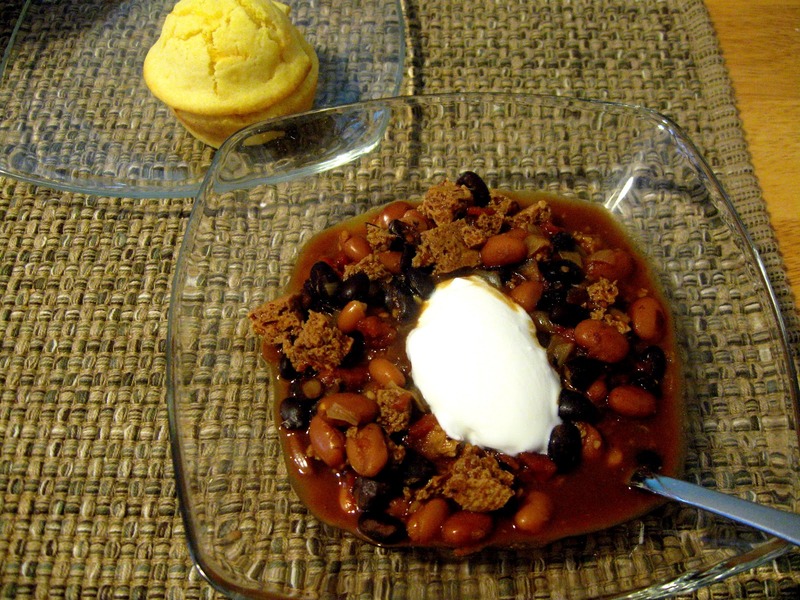 Serve the chili in bowls topped with sour cream and cilantro.